Are you interested in powering your northern home or business with solar energy? Many folks in the north are already producing their own renewable energy, but many more would like to start and don't know how. This project is our way of helping out. We aim to answer your questions about solar energy in an interactive and easy-to-understand way. We will collect data from our two solar demonstration and research sites for two years to assess the feasibility of solar electric systems in the northwest region. Along the way, we will present our findings to communities all over the northwest to help individuals, families, and local governments make the best energy decisions they can. Click the links below to see the live data from the solar demonstration sites, read the solar FAQ, and stay tuned for more upcoming energy workshops. Installing the Hazelton solar panels - in full sun, max system output is 1290 watts (1.29 kilowatts), about enough to run a fridge, a washing machine, and a laptop computer. Location: Storytellers' Foundation. 1600 Omineca St, Old Hazelton (Gitxsan territory), BC. Phone: 250 842 6500. Hours: Drop in anytime to see the panels and the solar display inside, or call ahead to set up a school or other community group tour. We would love to see you there. The Hazelton site consists of 6 roof-top solar panels that were installed by community members at a workshop in the fall of 2013. The solar panels are grid-tie (meaning that any excess electricity is fed into the grid and sold to BC Hydro). More details in FAQ below. Electricity production is now being recorded and broadcast online. *Note on Live Data: We had to replace the monitoring unit on Feb. 23, 2015, and so the data before this date will not show up on the live feed. Stay tuned for 2 year summary data coming soon. Need help reading the live solar data? Click this helpful diagram. Terrace Solar Demonstration Site - max output in full sun of 1240 watts (1.24 kW), about enough to run a fridge, a washing machine, and a few lightbulbs. Location: Northwest Residential Solar Demonstration Site, 4826 Walsh Ave., Terrace (Tsimshian territory), BC. Phone: 250 615 4026. Hours: Call ahead to see the panels and the solar display inside or to set up a school or other community group tour. We look forward to seeing you! The Terrace site consists of 8 thin-film (a newer technology that works better in low-light conditions) roof-top solar panels that were installed by community members at a workshop in the fall of 2013. The solar panels are grid-tie (meaning that any excess electricity is fed into the grid and sold to BC Hydro). More details in FAQ below. Electricity production is now being recorded and broadcast online. Community Solar Workshop - Hazelton, Nov. 2013. So I'm interested in solar energy, what are the basics I need to know? Start by looking over the questions here. 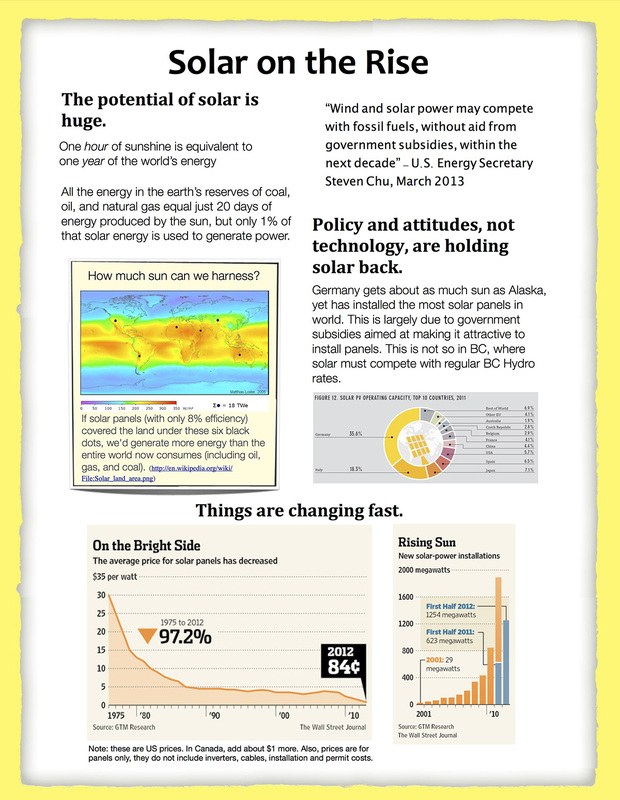 These are the most common questions we receive about solar energy. There's info on cost of systems, how long solar panels last, where to find a solar installer, and more. Also see the infographics at the bottom. If you have more questions, please call or email us. What is the difference between a grid-tie system and an off-grid system? A grid-tie solar system is connected into the electricity grid via your existing electricity meter (BC Hydro meter). When your solar panels produce more power than you need, BC Hydro pays you for the excess that is fed back into the grid (this money appears as a credit on your account). When your panels don't produce as much power as you need, you simply draw from the grid as usual. Essentially, the grid functions as a big battery. An off-grid solar system includes a battery bank as well as solar panels (so that you can have power when the sun isn't shining - like at night, and on cloudy days). Batteries require proper care (for example, they must not be over-drained) and some maintenance (some types require filling with water now and then). With proper care, they should last at least 10 years. Since most off-grid solar systems replace a gasoline or diesel generator, the fuel cost savings can be tremendous over just a few years, not to mention the reduced carbon emissions. Do I need back-up batteries for a grid-tie system? That depends on what you want. Most grid-tie systems do not have back-up batteries, making them very user-friendly and nearly maintenance-free for 25+ years. However, if grid power goes down with such a system, your solar system turns off as well (for the safety of electricians working on the grid). Back-up batteries are a greater upfront expense, require more care, and will need to be replaced every 10 years or so, but also give you piece of mind knowing that you won't be in the dark if the grid drops. How many panels do I need for a system on my house? With a grid-tie system, you have the freedom choose! Since you can still draw power from the grid, you do not need to cover all of your power needs with grid-tie solar panels. If you get more panels, you'll save more on your power bills and potentially earn money from BC Hydro by selling to the grid. If you get fewer panels, you'll simply make a smaller dent in your power bill. How many panels you get depends on space you have available, and money you have available. Typically, a residential grid-tie system will consist of 6 - 8 panels (for comparison, there are 6 panels at the Hazelton Demonstration Site - see photo), and produce between 1.5 kW and 2 kW (kilowatts) of power. A system this size would reduce your power bill by 10% to 30%. An off-grid system needs to be sized properly for your power needs (your "load"). A professional solar installer can make these estimates for you. Typically, an energy-efficient small home or cabin may require 2 kW of solar panels, and a bank of 3 - 6 batteries. 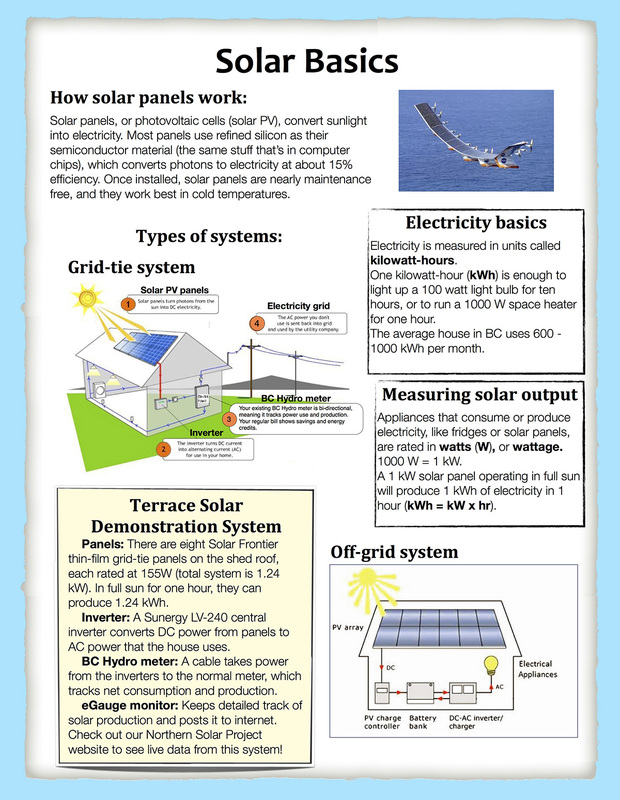 What are the components of a solar electric system? 1) Solar panels - available in various sizes and wattages. A common panel size (like the panels at the Hazelton Demo Site) is 250 watts, measures about 5 feet long x 3 feet wide x 1.5 inches thick, and weighs about 40 lbs. 2) Inverter - this device converts the direct-current (DC) electricity that the panels produce into alternating-current (AC) that your home uses. There are many types and wattages of inverters available, including "micro-inverters" which mount directly on the back of the solar panels (these are at the Hazelton Demo Site). 3) Cables and connections - you'll need a cable to carry power to the inverters, then to the main building breaker box. You'll also need a couple of "disconnects" (safety kill switches). 4) Mounting frame - this holds the panels, and is usually made of either aluminum or wood. Can be ground-mounted or roof-mounted. May be adjustable to change the seasonal angle of the panels. 1) Charger/Charge Controller - this device controls the amount of DC power flowing into and out of your batteries (you don't want to over-charge them). Many types are sizes available. -"Flooded-Lead-Acid" batteries are filled with a liquid electrolyte, and use lead-plated connections inside. They are the least expensive, last the longest, but require the addition of water on a regular basis. -"Sealed" batteries are filled with a gel electrolyte. No water needs to be added to them, they are easier to handle and less maintenance, but they also last a shorter time and are more expensive. -"Lithium-ion" batteries are lead-free and very high performance, but are also 10 - 20 times more expensive. They are just entering the renewable energy market. More info on batteries here. What is a thin-film solar panel? 1) Mono-crystalline Silicon - Oldest technology, yet still the highest performing. Made from slices of the purest silicon crystals (refined from sand). These panels are the most expensive, yet the most efficient per area at capturing sunlight: 15-20%. They have distinctive circular cells on the panel face. 3) Thin-film - Newer technology that is based on layering different types of photovoltaic material (amorphous silicon, or cadmium telluride, or copper-indium-selenium) onto glass. Least energy intensive to make, so least expensive. Around 9% efficient, but more efficient than silicon panels in low light conditions. Can be made into flexible sheets. Lose more efficiency over time compared to silicon panels. 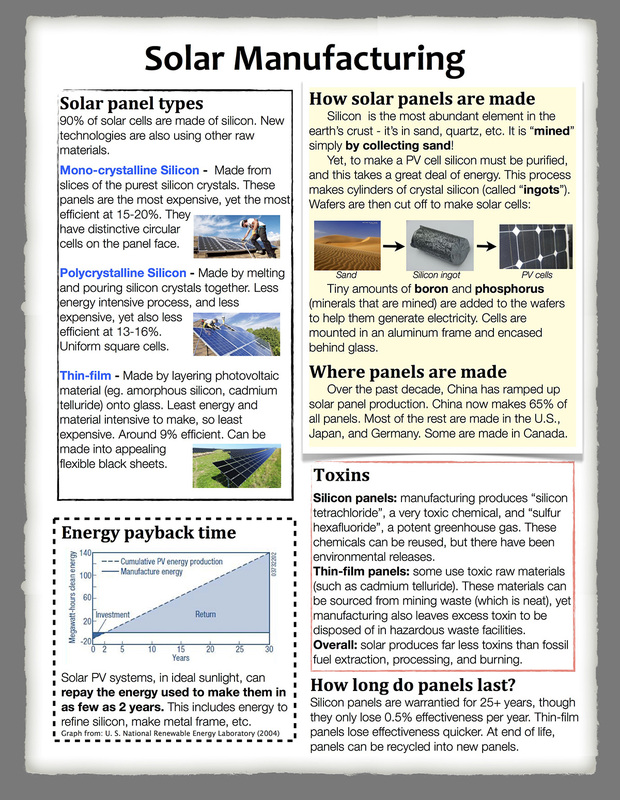 How are solar panels made? Are they environmentally safe? See infographics at bottom of page for details. What type of panels and inverters are at the Hazelton and Terrace Demonstration Sites? - Adjustable aluminum frame welded by Alumafix and Sons. - One Sunergy LV-240 Inverter (5000 watts max). Materials for both demonstration sites supplied by Goose Creek Renewables. How much does a solar panel system cost? Lucky for us all, the cost of solar panels has dropped by 97% in the past 35 years! Nevertheless, buying a solar electric system involves a lot more than just the panels, making an entire solar system still a large investment. 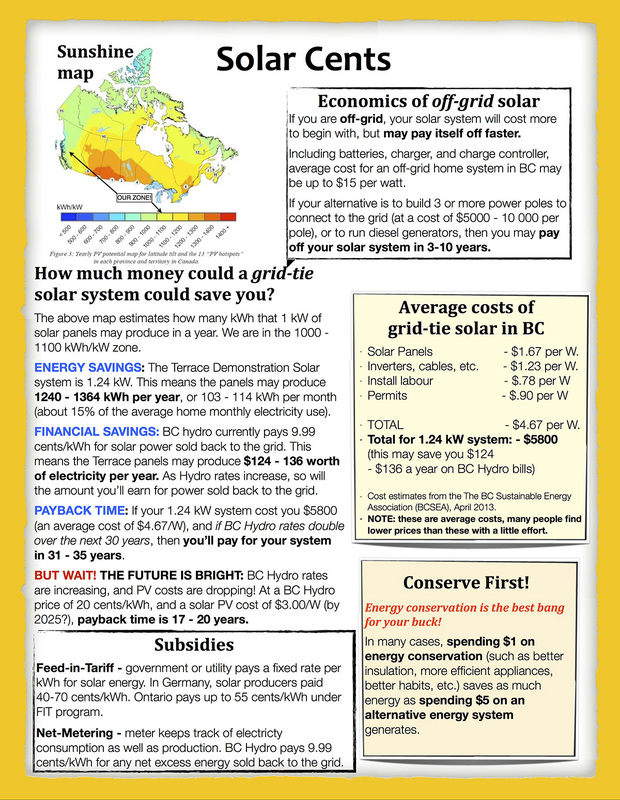 In August 2013, the BC Sustainable Energy Association figured out that when all these costs are factored in, a residential grid-tie solar system in BC costs on average $4670 per kW (see their study here). This means an average residential grid-tie system (2 kW, 8 panels) in BC costs around $9340 all said and done. Note: this is an average price. If you shop around, you'll very likely find better deals on the materials. Also, some people know electricians and can save money on installation costs. The electrical permit cannot be avoided. For an off-grid system, the cost can vary a lot depending on how many and the type of batteries you get. You're looking at between $15 000 - and $30 000 to cover the power needs of a relatively energy-efficient small house or cabin (2 kW system with 3 - 6 batteries). How much electricity will a set of solar panels produce? We are collecting data from Hazelton and Terrace to know the exact answer to this question! However, in the meantime, it is possible to use satellite data to estimate how much energy a solar system will generate in NW BC. 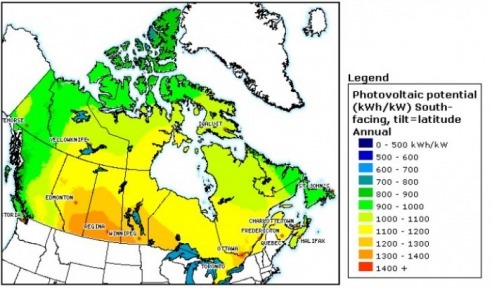 There are a number of maps online which show how much solar energy different parts of the country receive (for example, see map below, or see this nice one, or this one from the Government of Canada). These maps are based on many years of data collected from weather stations and satellites, and factor in weather, seasons, etc. They tell you how much power (measured in kilowatt-hours, or kWh) a 1 kW solar panel system will produce in a single year. Most of NW BC falls in the range of 900 - 1100 kWh, per 1 kW of solar panels, per year. This means an average residential solar system (2 kW, 8 panels) will produce between 1800 and 2200 kWh per year. This is about 20 - 30% of the total power an average house in BC uses per year. How much it could I really save on my electricity bill? Since there is more sun in the summer, you'll save much more on your power bills in the summer than you will in the winter. If you have a grid-tie system, any credits you receive in the summer can help off-set winter costs. Remember, these are just estimates! As we collect data from our Hazelton and Terrace research sites, we are building a table like this one based on what our solar panels actually produce. How long will it take to pay a solar system off? For a grid-tie system, this is somewhat difficult to determine, given that BC Hydro rates are increasing all the time. As rates increase, the money you save by generating your own electricity increases as well, which affects the overall payback time of any renewable energy system. No one knows how high BC Hydro rates will be in 25 years from now (when the warranty on solar panels bought today would run out), but if we assume that electricity price continues to increase at the same rate it is now (28% every 5 years), then it will increase 140% by 2039, from 6.9 cents/kWh today to 20 cents/kWh. With this in mind, if a set of 8 solar panels (with a total power of 2 kW, costing an average of $9340) saves you $151.80 on your power bill in 2014, then these same panels may save you around $440 per year in 2039. 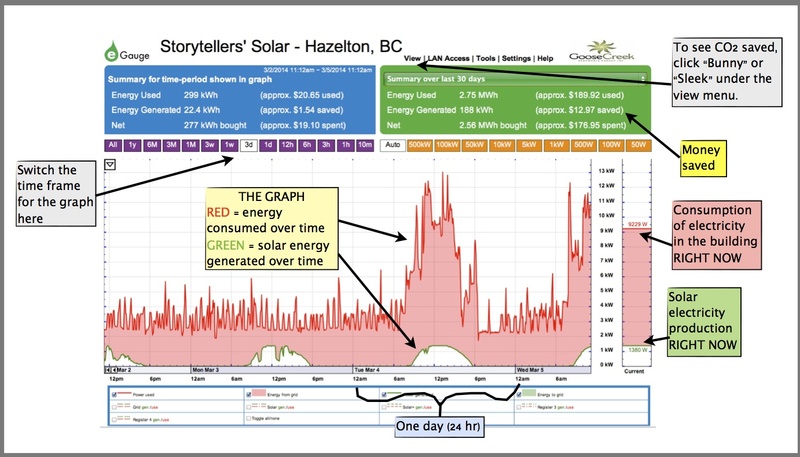 This results in a payback time for grid-tie solar in NW BC of 30 years. For an off-grid solar system, the pay-back time is often much shorter, usually under 10 years. This shorter payback time is because the alternatives to generating your own off-grid renewable energy are much more expensive: either generating electricity using a gasoline or diesel generator, or building power poles to connect your location to the grid. You save these costs when you use solar energy. Talk to a solar installer to get a quote of how long it would take to pay off your off-grid system. A net-meter is an electricity meter that can monitor both power consumption and production. All BC Hydro meters (both digital smart meters, and the old analog meters) are net-meters, meaning they are already set up for grid-tie solar. If you have grid-tie solar panels, your net-meter will record how much power you consume over your regular two-month billing cycle, as well as how much power your solar panels produce over the same period, and then calculate the difference between these amounts. If you end up having produced more power than you used, BC Hydro will credit your account for the excess power at a price of 9.99 cents/kWh. If you used more than you produced, you will be billed for only the electricity you received from the grid, not for any you produced yourself. If you do install grid-tie solar panels, you'll need to set up a net-metering account. It's free, and takes only filling out a one-page application. 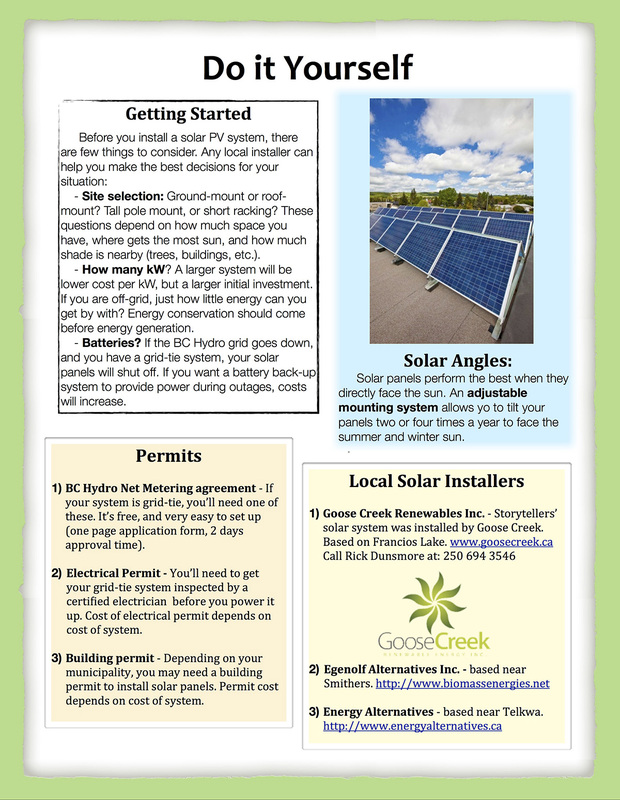 See BC Hydro net metering for more info. Are there incentives, grants, or rebates available? Unfortunately, besides BC Hydro's net-metering program, there are no incentives for solar panels in BC at this time. Some municipalities have had incentives in the past, but none are in place for NW BC. 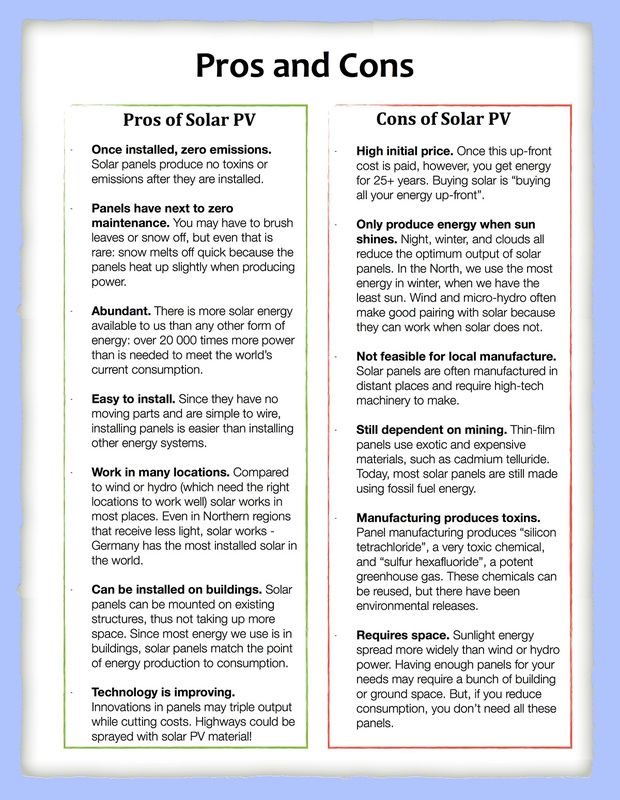 Why should I be concerned about energy conservation if I am interested in solar energy? It's always more cost-effective (and environmentally friendly) to invest in energy conservation (eg. more efficient appliances, getting rid of unnecessary appliances, installing better insulation, learning better energy habits) BEFORE you invest in any renewable energy generation system. This is simply because it's a lot easier (and cheaper) to save energy than it is to generate it. For example, if you lived in a big house with 50 light bulbs (of the old-fashioned 60 watt incandescent kind), you could save $150 per year on your power bills simply by switching to compact-florescent-lightbulbs (at 13 watts each). This is the same savings that a solar panel system (2 kW) might give you on your power bills in NW BC. Now the important part: switching the light bulbs might cost you $200, while putting up 2 kW of solar panels might cost you $9000. No brainer, right? The point is that if you want to invest in renewable energy system, start by reducing your consumption first. After you have made your home or business very energy efficient, it then may make sense to invest money in generating new energy. Where do I find a solar installer in the Northwest? 3. Egenolf Alternative Energy - Smithers, BC. Ph: 250 847 8780. Email: see website. Solar photovoltaic panels (Solar PV) work by converting sunlight into electricity. The face of a solar panel is covered in a sheet of very thin crystals, usually made of purified silicon. When light strikes these silicon crystals, an electric current is produced via a natural property of the silicon material. The electricity is directed into wires for use. How long will solar panels last? Do they need maintenance? Solar panels generally last a very long time. Most panels are warranteed for 25 years, but many panels have been operating for 40+ years, and have only lost a small amount of their effectiveness. They last so long because they contain no moving parts (which wear out), and are encased in strong protective glass. Solar panels themselves need hardly any maintenance at all. Virtually the only thing that has to be done is to keep them relatively clean. We are lucky in the north because when solar panels are angled correctly in the winter, they stand nearly vertical, meaning no snow collects on them anyway. Batteries for solar systems last around 10 - 15 years if very well cared for (they must not be over-drained or over-charged, some cannot be exposed to temperature extremes). Some types do require maintenance (you may need to add water periodically). Is it worth it to get a solar-tracker? A solar-tracker is a special type of mounting frame that moves your panels throughout the day to face the sun using usually an electric motor. If you use a tracker, you will get more power from your panels. However, solar trackers are quite expensive, and because the price of solar panels has fallen so much, most solar pros now say that money spent on a solar tracker would be better spent (ie. you'll get more overall energy) simply on buying more non-tracking panels. Solar panels are usually mounted on either aluminum or wooden frames. There are not many standardized frames for solar systems, so each installer likely makes their own. You can make your own too if you are careful to calculate the strength needed to withstand wind and snow loads. Some frames are adjustable, meaning the angle of the panels can be manually changed through the seasons (usually 2 or 4 times per year) to catch the high summer sun and the low winter sun. Manually adjustable frames are well worth getting and using, as they will increase the power you get from your system over the year, and aren't much more expensive than stationary frames. What other factors should I consider if I am thinking about getting solar panels? You should always consider ways to reduce your electricity consumption before you consider investing in any renewable energy system (see the energy conservation question above to know why). You'll need good south-facing exposure. Panels can be mounted on roofs of almost any pitch, or they can be mounted on the ground. Panels should be mounted facing directly south, or as close-to south as possible. Any shading (from nearby trees or buildings) will reduce the output of your system. With all these factors in mind, estimate how much space you have available for panels, and then determine how many you'd like to invest in to meet your power needs. If solar looks like a good fit for at your location, you can also contact a solar installer to get a professional opinion.